WASHINGTON, D.C. (CT&P) – Experts from several university research groups around the world are warning U.S. government officials that Representative Michele Bachmann (R-MN) may be rapidly approaching the end of her battery life. If this occurs, the researchers warn, Bachmann’s operating system will automatically switch over to emergency reserve power, which will only keep her body alive. What little brain function she has left will cease altogether, making her an unpredictable killing machine with the strength of a psychotic chimpanzee. 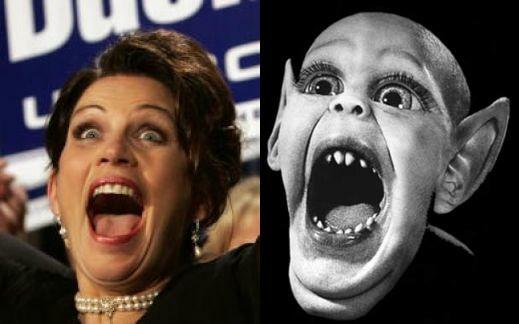 Although Bachmann has been highly erratic and shown little ability to reason throughout her political career, she was never thought to be a danger to those around her or the general public. Most people who heard her weird ideas and imbecilic statements just ignored her like they would a mentally challenged third-grader. That could change if her batteries totally fail and she switches to emergency power, according to Professor Roberts. Both professors recommended that for the safety of her family and the American public, Rep. Bachmann should be physically restrained and placed in a controlled environment so she could be observed around the clock.